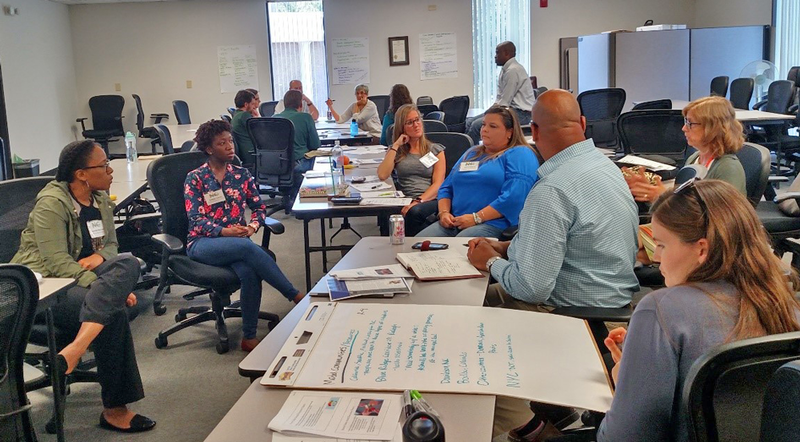 One of the most rewarding things about being a part of Planners4Health has been the opportunity to meet with professionals across North Carolina and hear what they are working on at the junction between public health and planning. On September 8, 2017, we hosted our first roundtable at the North Carolina Department of Health and Human Services in Raleigh. The 13 participants in this roundtable represented a wide variety of organizations including local and state health departments, councils of governments, active routes to school programs, city planning departments, universities, and not-for-profit organizations. On September 26, we held our second roundtable in Greenville, North Carolina, as part of the 2017 American Planning Association North Carolina Chapter’s annual conference. There were 25 participants in this roundtable, mainly from the eastern part of the state and from various fields including planning, parks and recreation, public health, medical services, universities, not-for-profits, and even a town resident and a representative from a local church. Task force members convene at Planners4Health roundtable in North Carolina. Photo by Katherine Hebert. Identifying and Strengthening Current Initiatives: What active initiatives / collaborations / resources / programs already exist in your community? North Carolina? United States? How can we grow these initiatives? Who is missing from the conversation? What are the strengths and weaknesses of these initiatives? What resources would be most helpful to strengthen these initiatives? Models/Resources: What could be used as a model for other communities and/or North Carolina? Do you know of other helpful resources that already exist? Who else should we be talking to in North Carolina / the U.S.? Who are your models? Moving Forward: What are the challenges in North Carolina? How can we move forward in addressing these challenges? What are some recommended actions for Plan4Health NC? Planners toured the complex as part of the chapter conference, including a stop at the community garden where participants learned more about the garden while sampling produce and snacks from the farmers’ market. They then crossed over County Home Road, using one of the first rural crosswalks in the state, to learn more about the history of Eastern Carolina while standing in a general store, sitting in a church, and exploring a typical school, house, and barn from the 19th century. Other initiatives and models identified during the two roundtables included: North Carolina’s Eat Smart, Move More Campaign, the Active Routes to School Program, Community Food Strategies and the 30-plus food policy councils in North Carolina, the multiple universities and research centers across the state, and strong public-private partnerships with organizations such as the Y, AARP, community and regional foundations, and places of worship. Also encouraging were the number of collaborations taking place between planners, public health officials, park and recreation professionals, health providers, government leaders, engineers, farmers, schools, and community leaders. While there are a lot of things coming out of North Carolina to be proud about, there are also some challenges. Securing stable, consistent, and flexible funding for projects at the intersection of planning and public health and for planning or public health projects in general, is often a challenge. Increased collaboration and coordination among sectors and across geographic boundaries to provide public services is needed. Political support at the local, state, and national level is often lacking. Clear, concise, and targeted communications about the benefits and strategies to accomplish specific planning and public health topics (i.e. complete streets, food policy councils, open use policies, community gardening, etc.) is needed. Finally, better tracking, evaluation, and promotion of existing practices and initiatives is needed to encourage the growth of the healthy community planning movement. Looking forward, the roundtables provided a lot of food for thought for Plan4Health NC, a new standing committee of APA-NC. Suggestions ranged from organizational items such as making sure racial and social equity was part of our mission and goals and having a joint APA and American Public Health Association conference, to providing additional resources and education including case studies, infographics, and in-the-field learning opportunities. While we have a lot of work ahead of us, the people behind Plan4Health NC are up for the task! Top image: Task force members at Planners4Health roundtable. Photo by Kyle Kettler. Katherine Hebert is the healthy community design specialist at the Centralia Council of Governments.